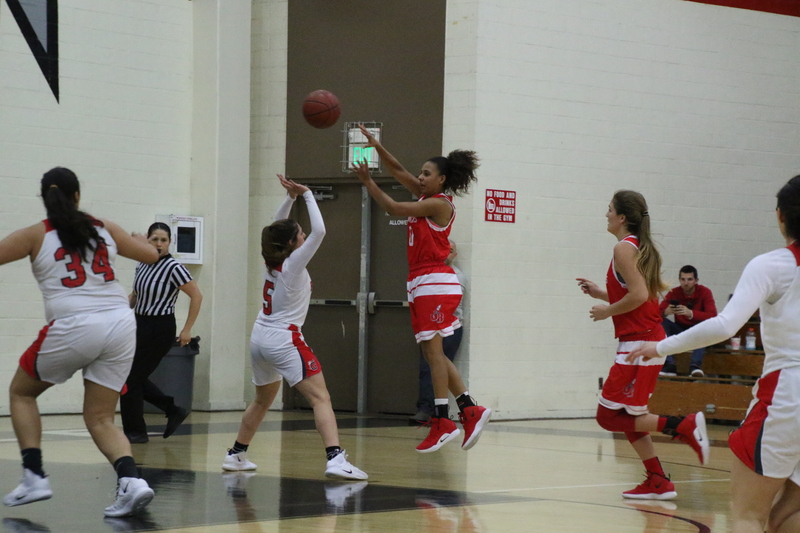 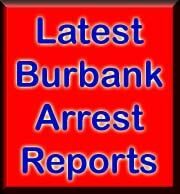 At the end of the first half and at the close of the fourth quarter of Tuesday’s Pacific League girls’ basketball game, Burroughs High allowed extremely long three-pointers which essentially handed visiting Crescenta Valley a 32-29 triumph. 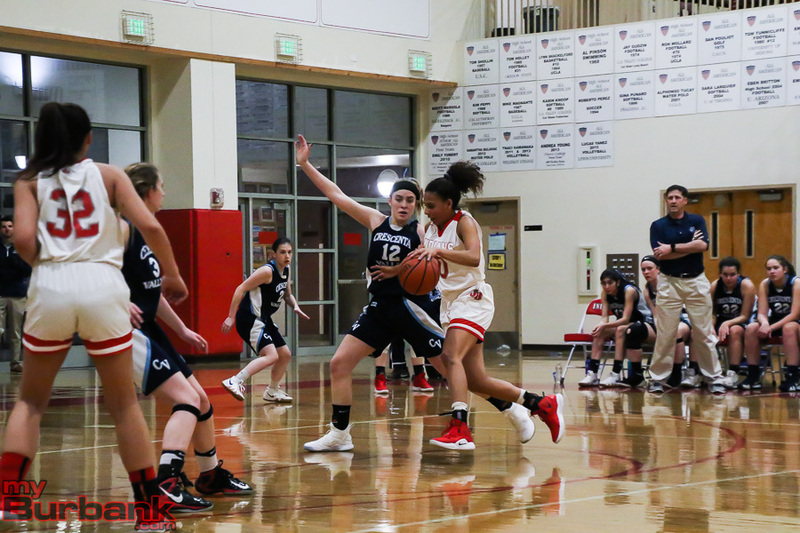 Senior point guard Mari Lee scored a game-high nine points for the Falcons and all came via three-pointers. 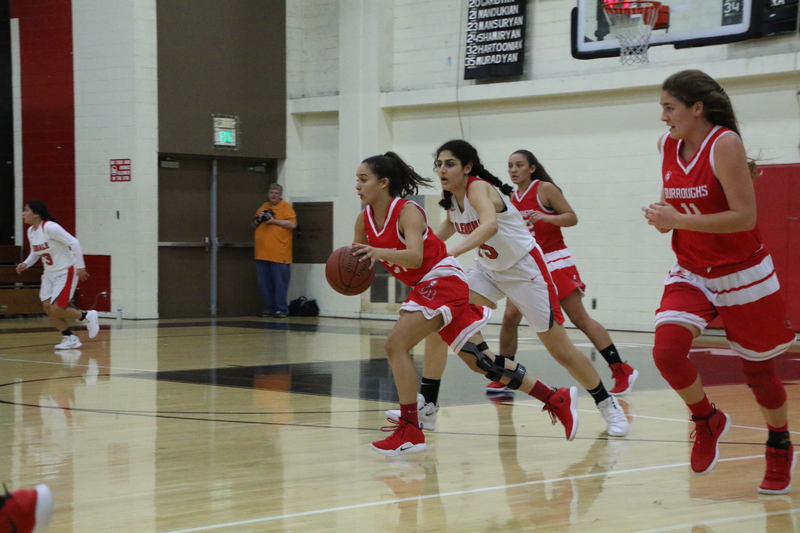 A hoop from senior guard Ariana Farias (team-high eight points) evened the score at 29-29 with five seconds left. 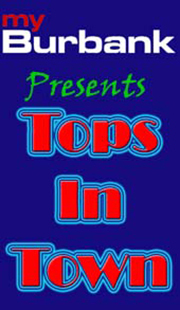 It appeared for all intents and purposes that the contest was going to overtime given that the Falcons had to go the length of the floor. 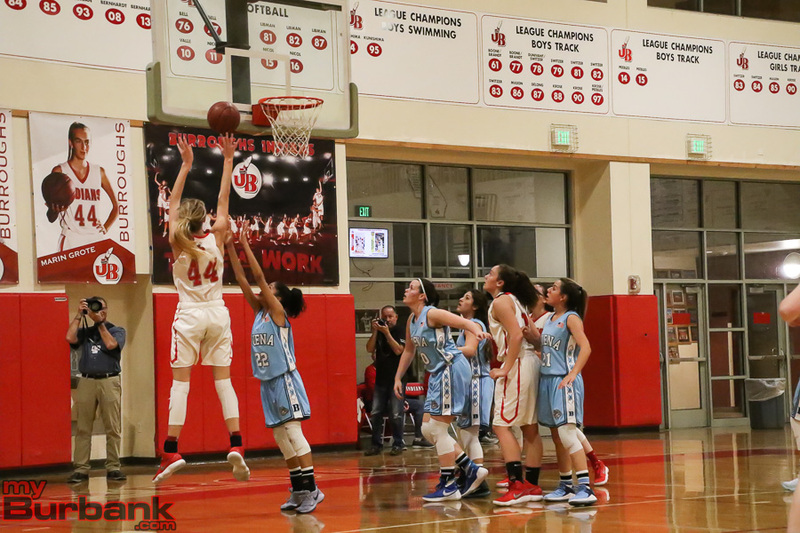 Sure enough, that’s exactly what they did and when Lee secured the ball in her hands and then launched a 35-footer at the buzzer, just like the first half 30-foot hoop that trimmed the Indians’ lead to 15-12, this one also swished through, but this time it gave the visitors a shocking three-point win that snapped a tie between the Indians and Falcons in league play. 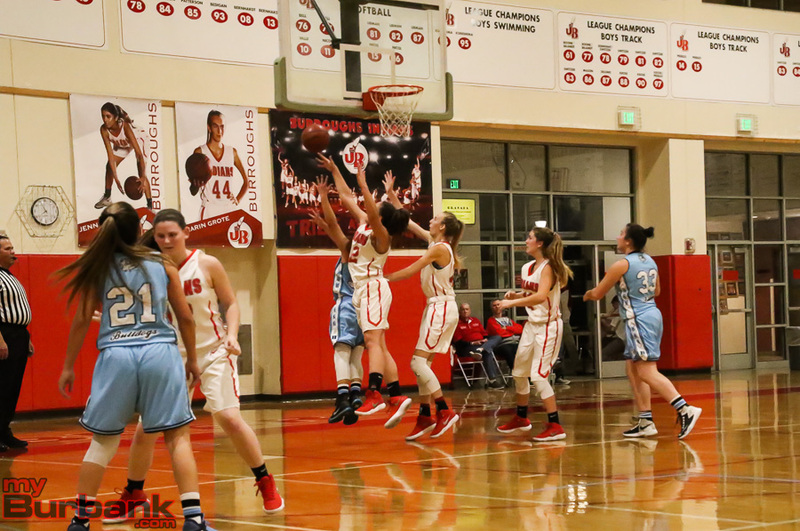 With 2:10 remaining on the clock, a basket from Crescenta Valley senior power forward Alin Mazmanian (four points) shoved the Falcons (15-9 and 8-3 in league) ahead 28-25. 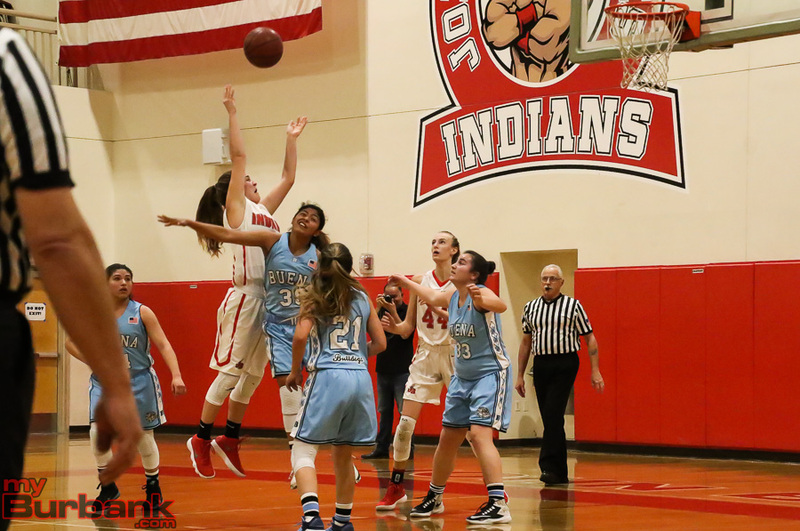 The Indians (18-7 and 7-4 in league) responded in kind as sophomore power forward Kayla Wrobel, who scored all of her six points in the fourth quarter, dropped in a bucket that sliced Crecenta Valley’s lead to 28-27 with 32.8 seconds left. 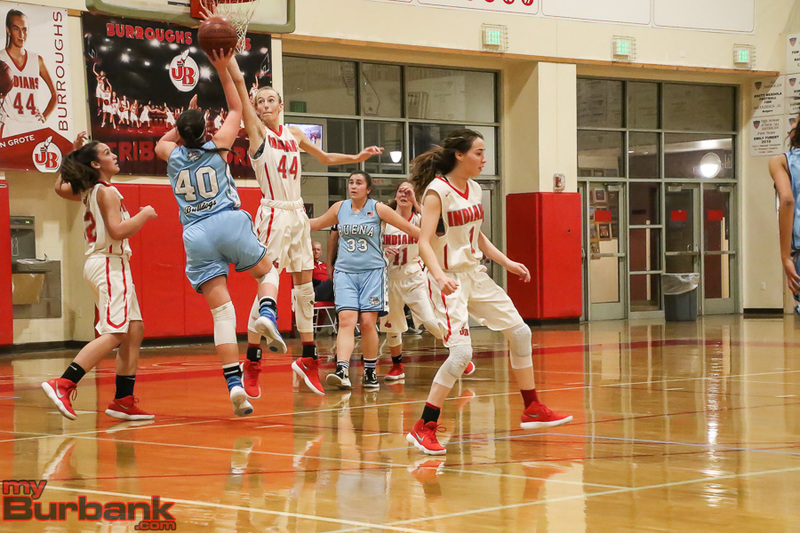 Crescenta Valley’s top scorer and best player, 6-foot senior shooting guard/power forward Caity Bouchard was limited to three points. 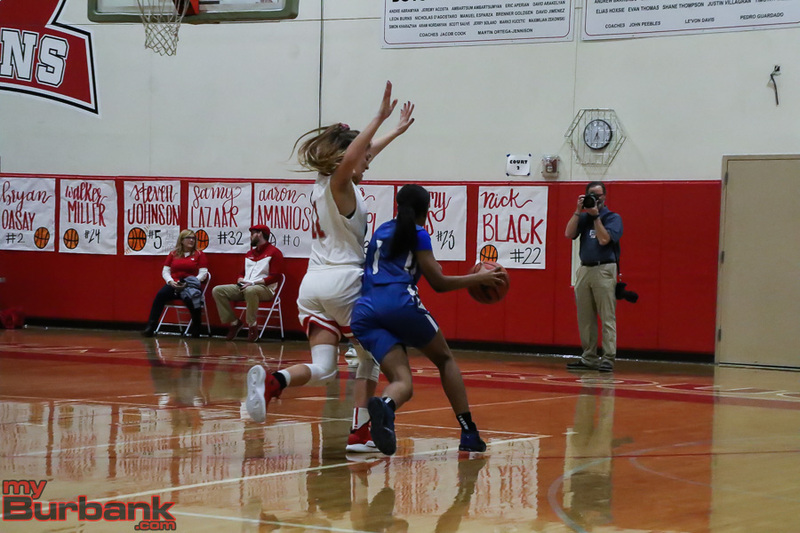 One of Bouchard’s points came at the free-throw line in the fourth quarter when she knocked down just one of three. 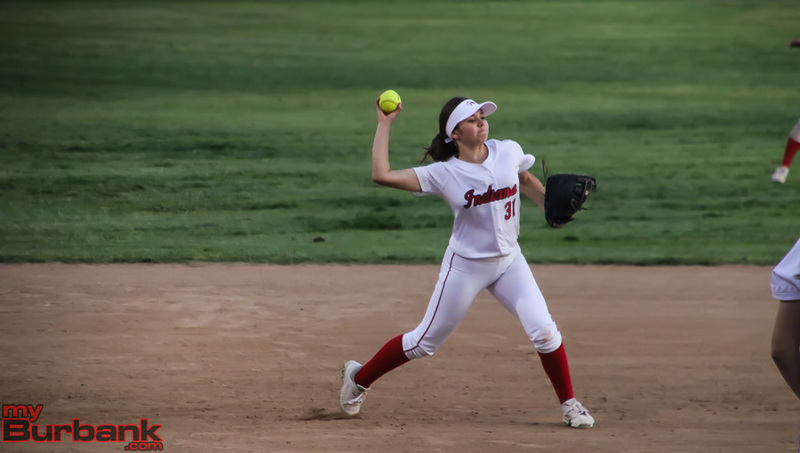 Bouchard was held in check offensively primarily because the Indians played excellent team defense and also fronted her on occasion. 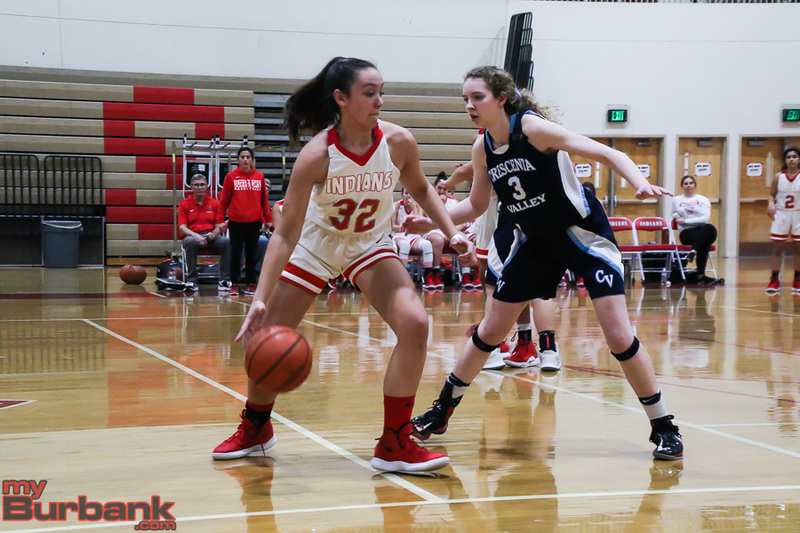 The opening half of the contest wasn’t filled with lot of points as the Indians outscored the Falcons 7-3 heading to the second quarter. 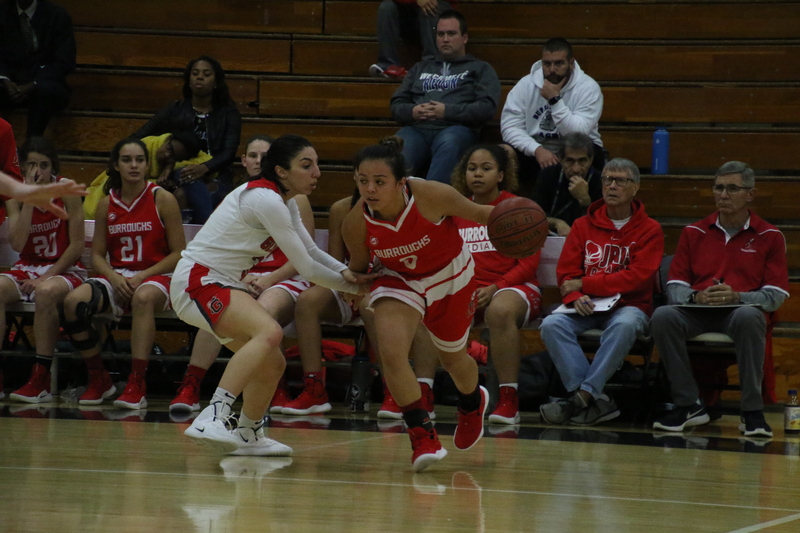 Senior forward Nicole Rumfola (seven points) drilled the Indians’ only three-pointer in the initial period while sophomore guard Dyani Del Castillo scored two of her four points and Farias also dropped in two points. 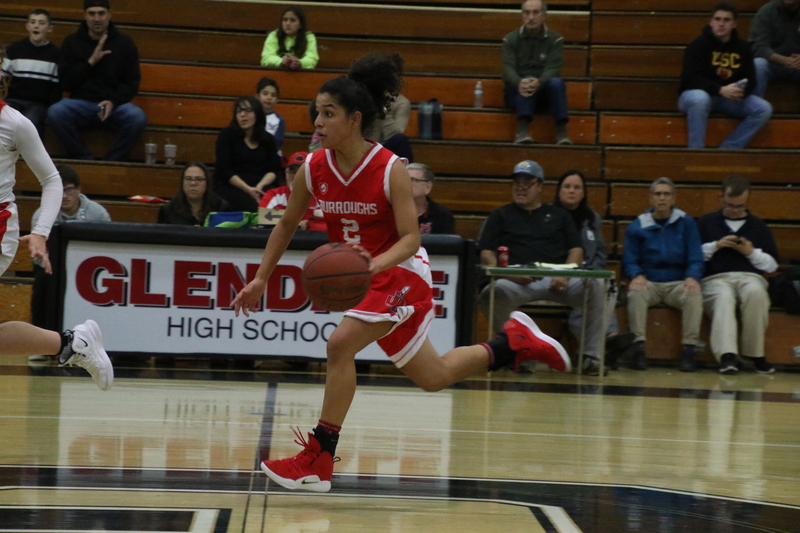 Rumfola, Farias, junior guard A’sia Morales and sophomore center, 6-1 Faith Boulanger, all scored two points in the second quarter. 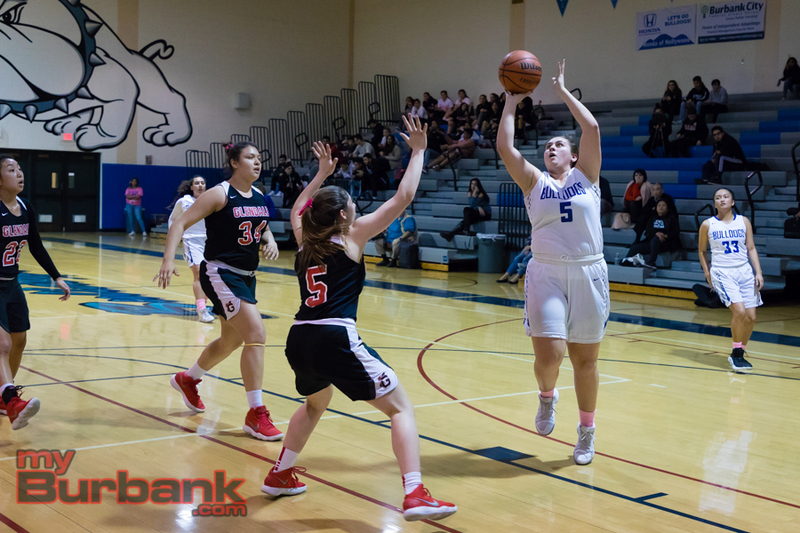 Boulanger finished with only two points and had been averaging more than 15 points on the season. 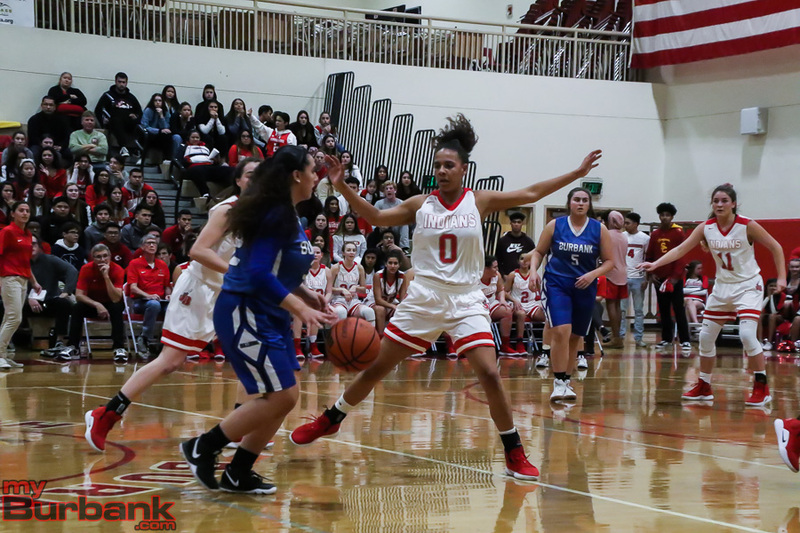 The Indians missed their first four attempts from the field in the third quarter and all four shots from the free-throw stripe and managed to tally six points. 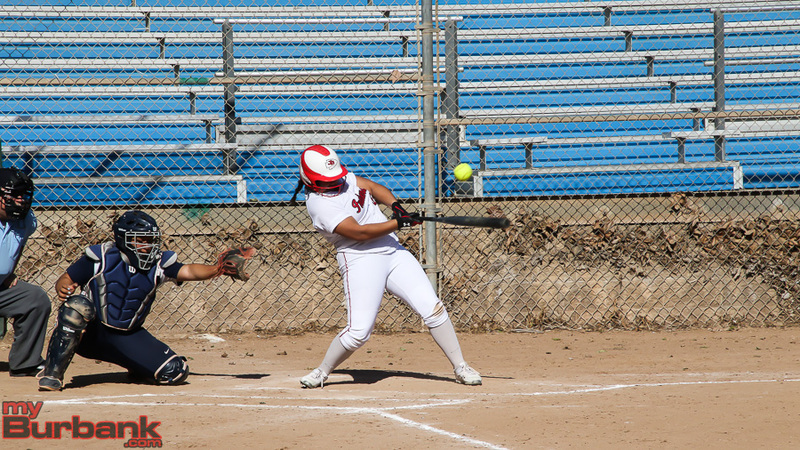 Burroughs didn’t score until Rumfola broke the skid with a basket. 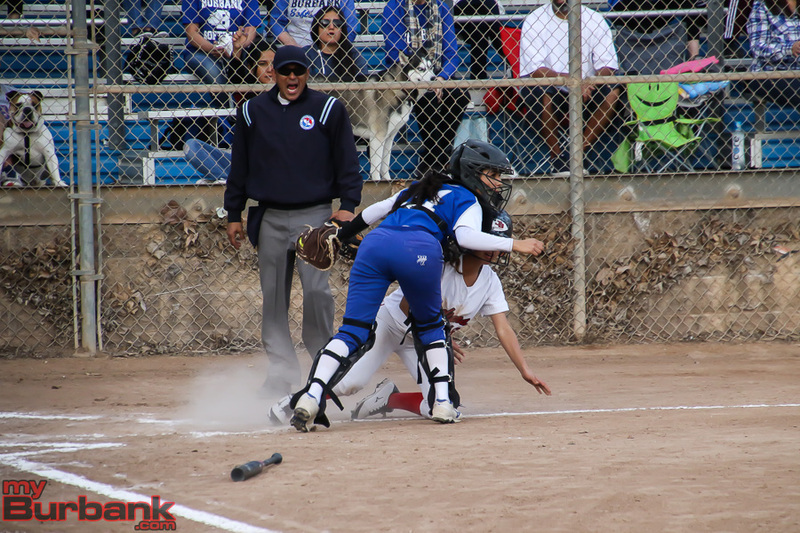 After the Indians missed a shot, Del Castillo scored and after back-to-back unsuccessful tries, Farias scored. 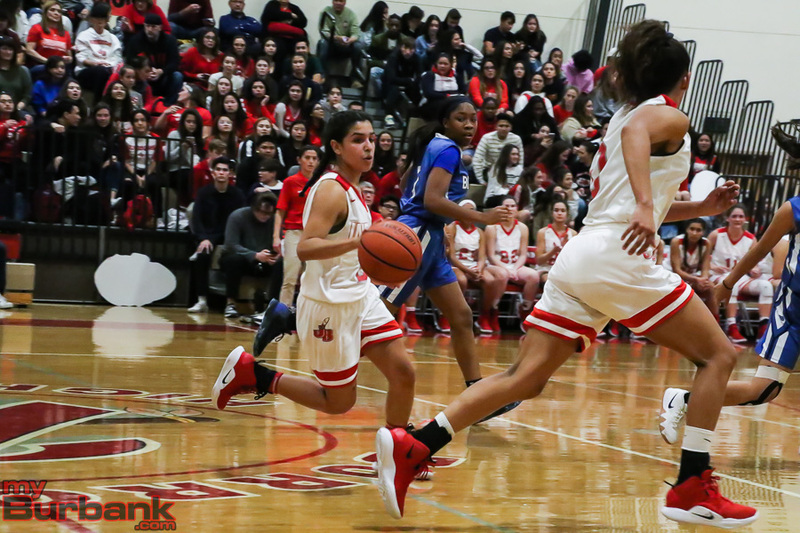 The Falcons scored 10 points in the third frame with Lee and senior shooting guard Georgina Kregorian (five points) both hitting treys and led 22-21 heading into the fourth period. 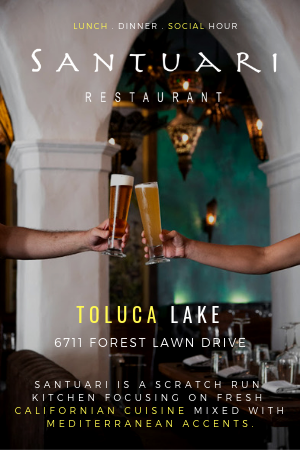 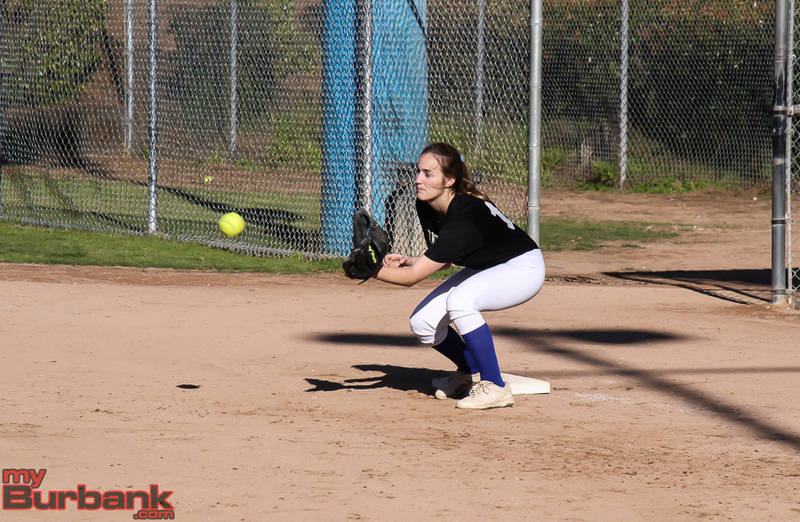 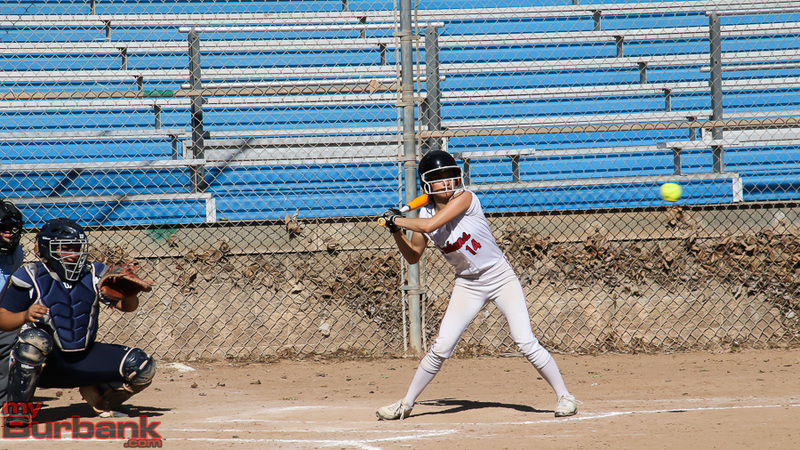 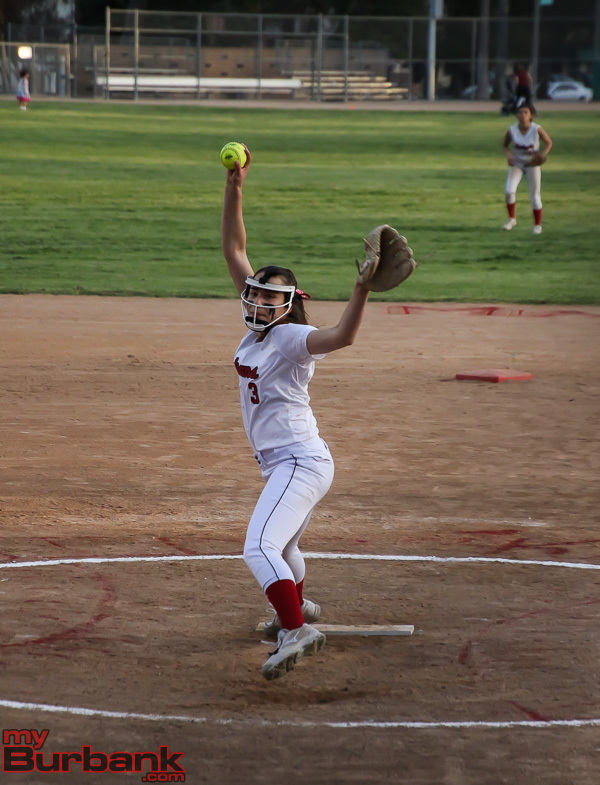 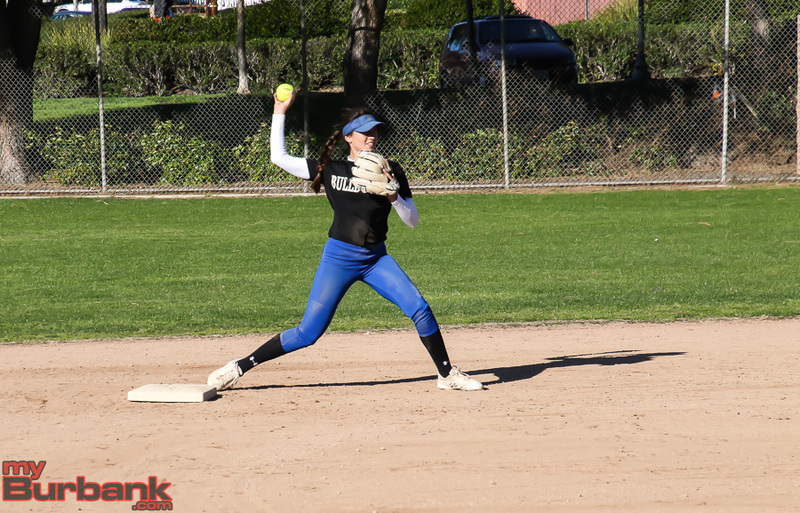 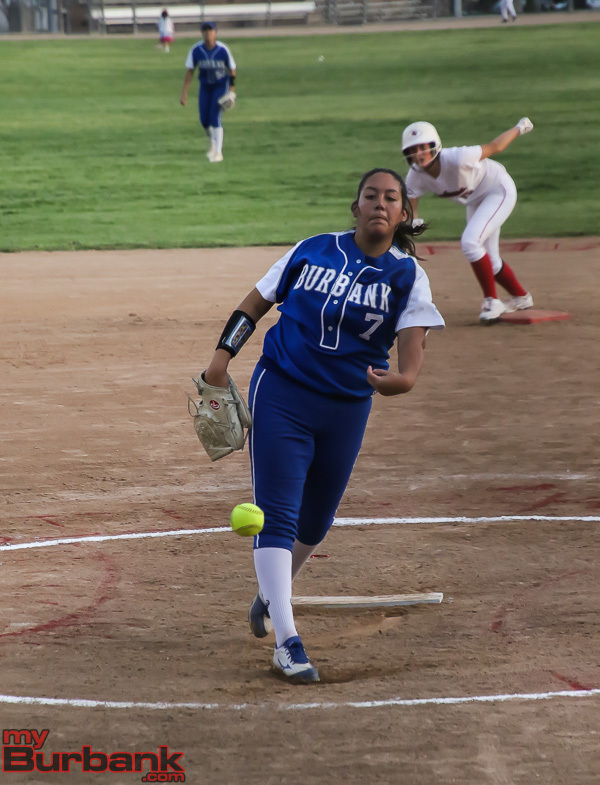 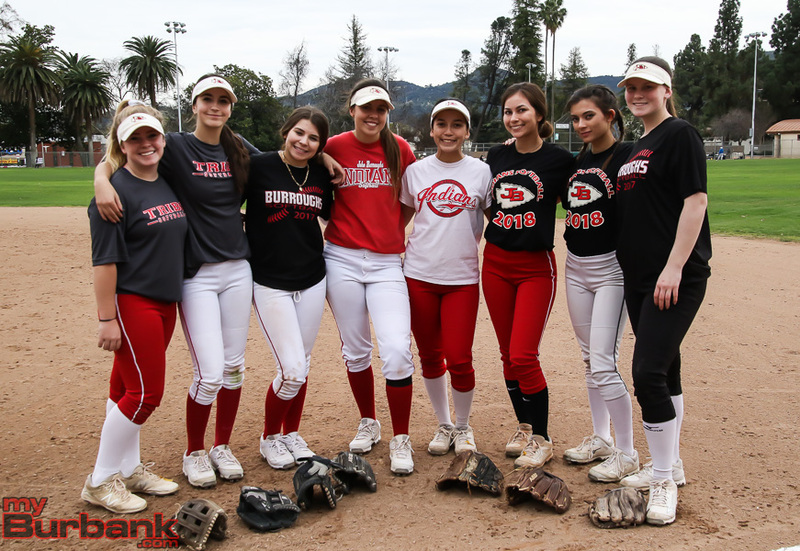 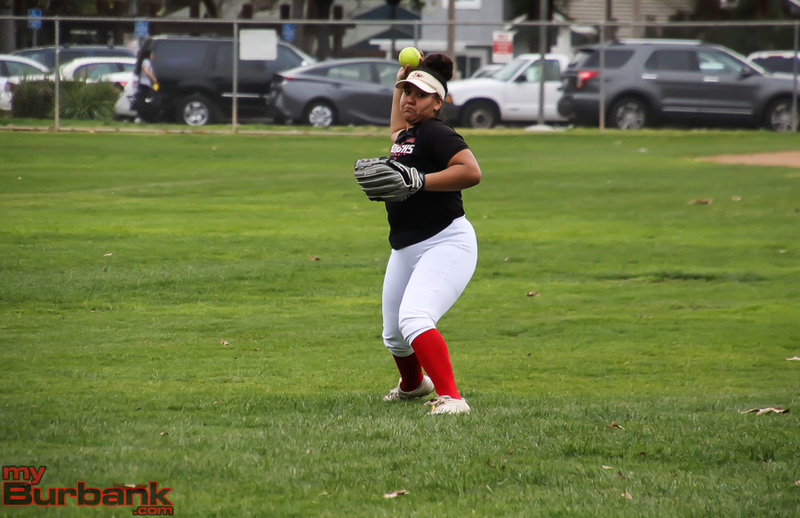 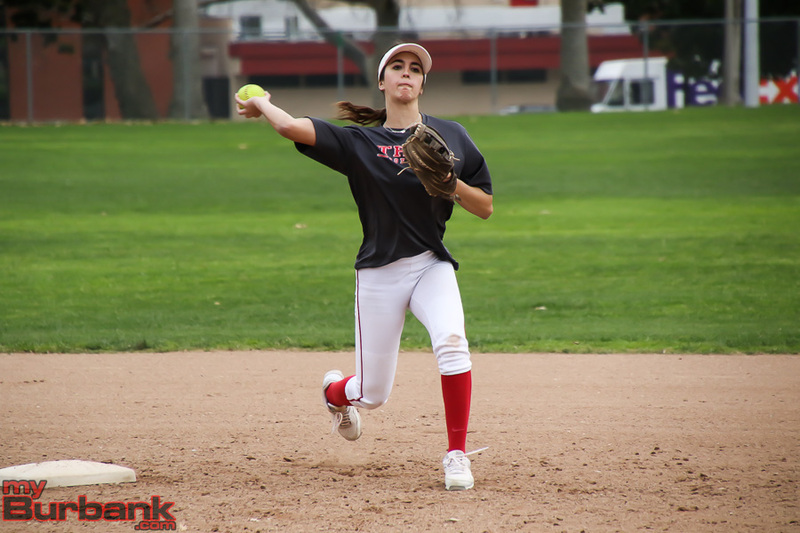 This entry was posted in Girls Basketball, Sports and tagged A'sia Morales, Ariana Farias, Burroughs High, Dyani Del Castillo, Faith Boulanger, girls basketball, Kayla Wrobel, Nicole Rumfola, Pacific League on January 23, 2019 by Rick Assad. 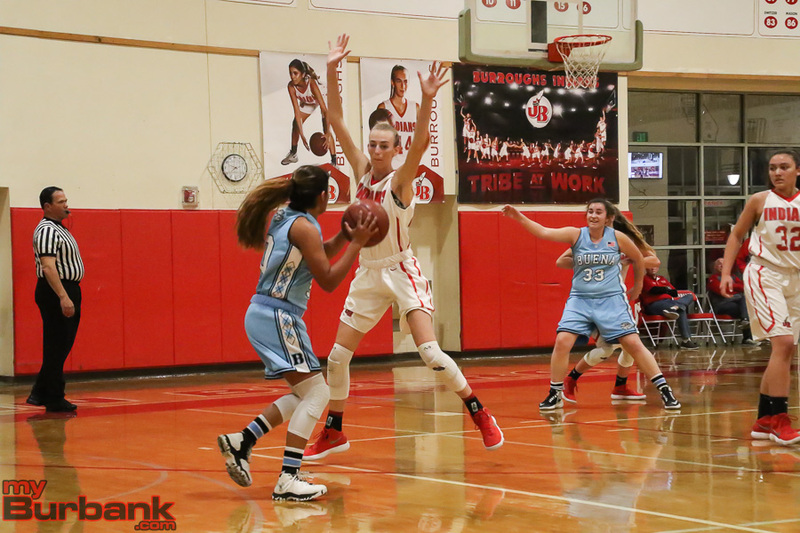 The race to the Pacific League title just got a little more difficult for the Burroughs High girls’ basketball team. 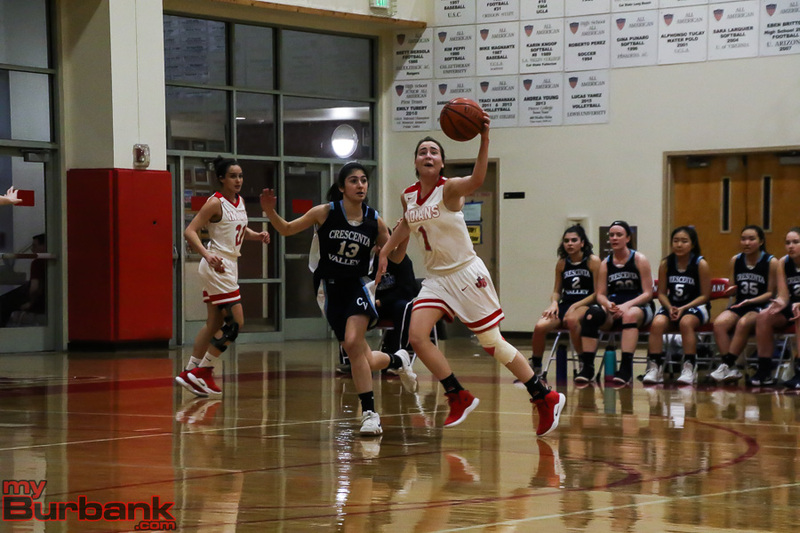 The Indians, winners of at least a share of the league title five out of the last six years, got edged out at home Thursday night by upstart Pasadena High, which rallied for a 57-56 win. 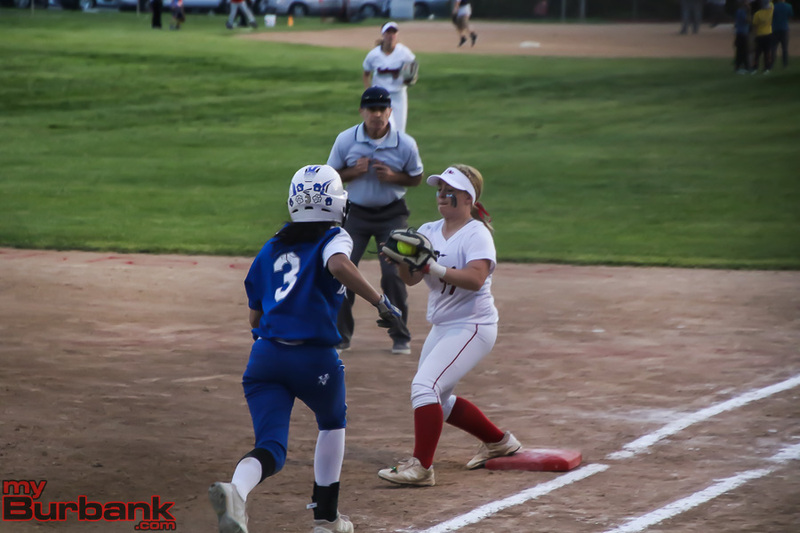 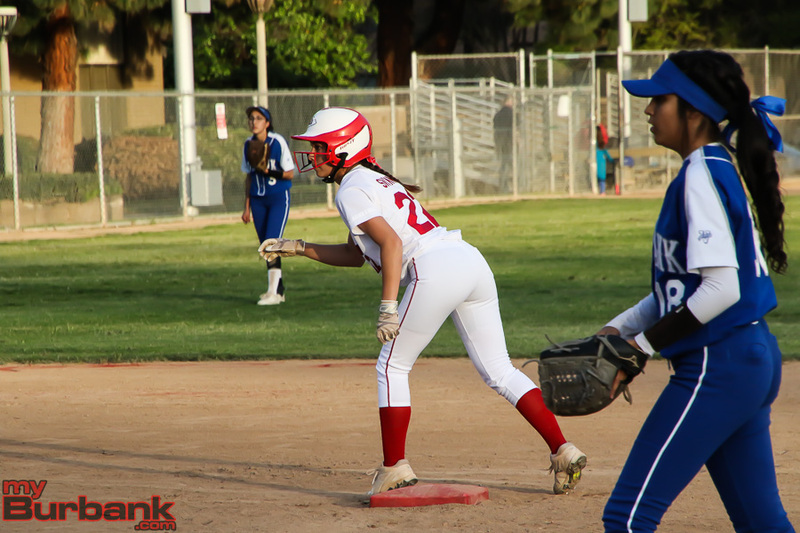 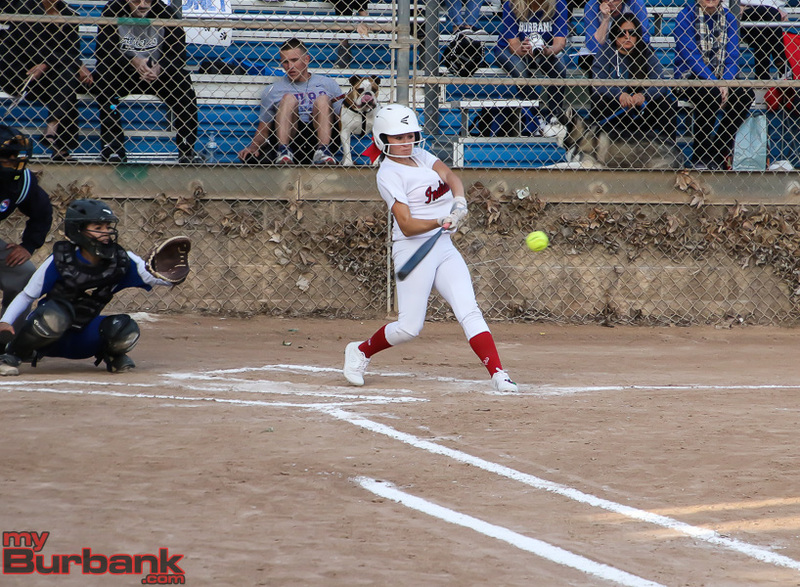 Burroughs (10-3, 3-2 in the league) traded the lead 12 times with the visiting Bulldogs. 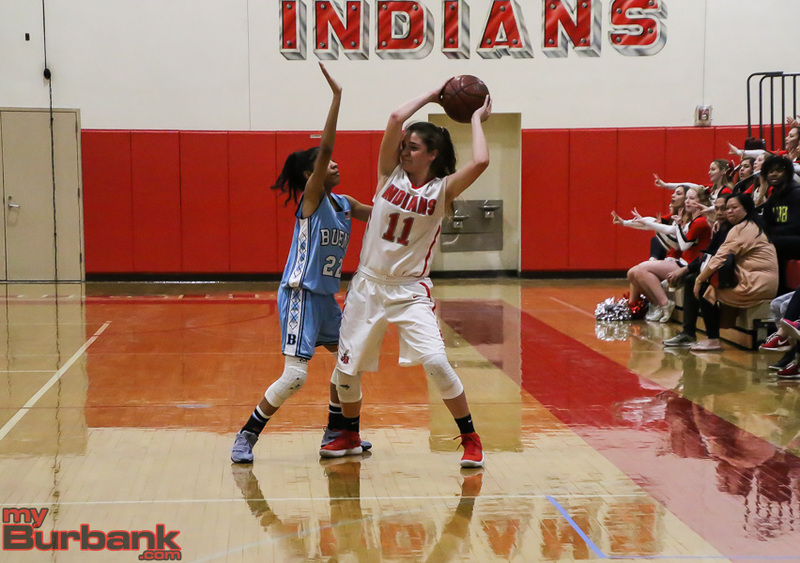 The Indians led by as many as 10 at one point in the third quarter and by as much as six in the final quarter. 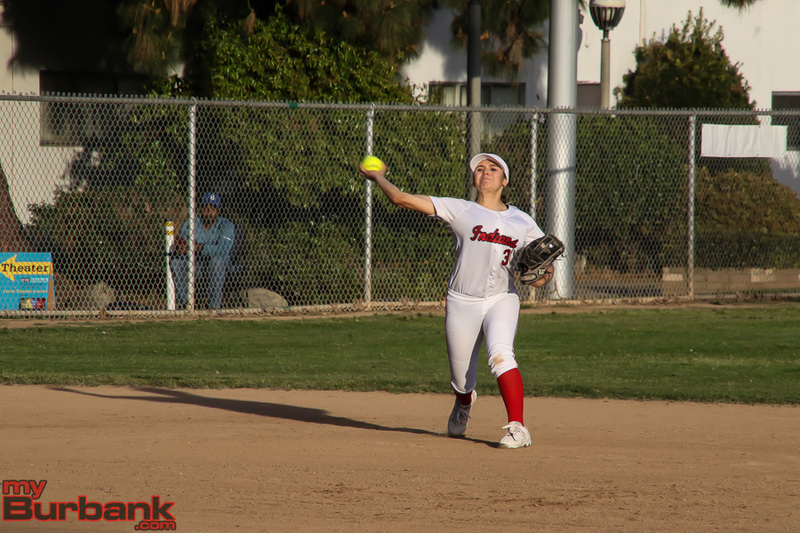 But the Indians were unable to maintain the momentum. 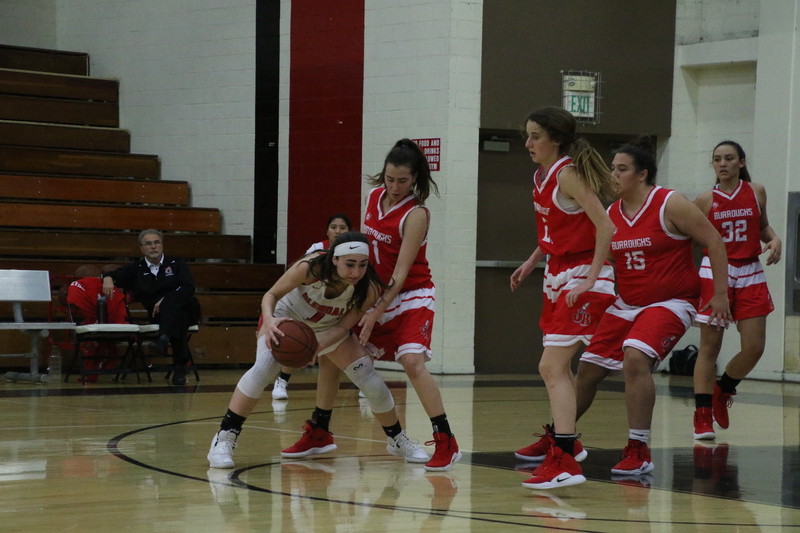 A short jumper by Kayla Wrobel gave Burroughs a 56-55 lead with 1:13 to play. 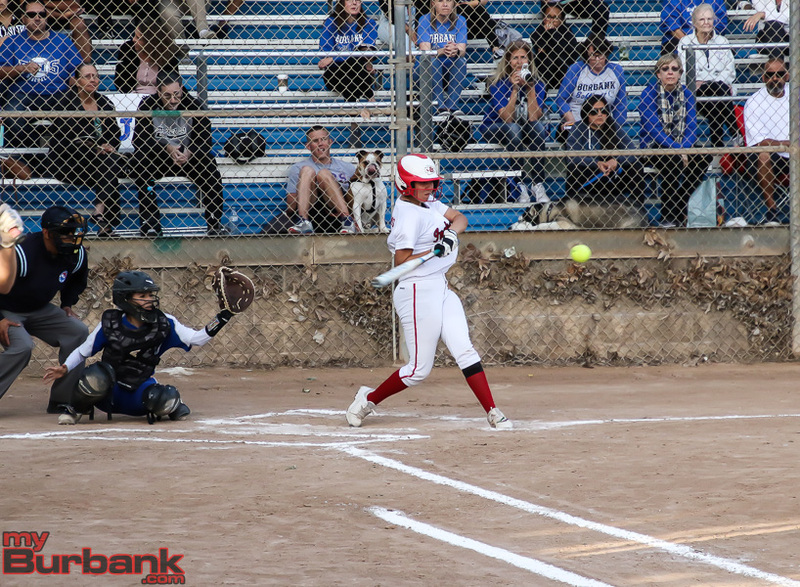 Following a timeout, Pasadena’s Sydney Brumfield came back to score with 1:03 left, giving the Bulldogs only their second lead of the second half. 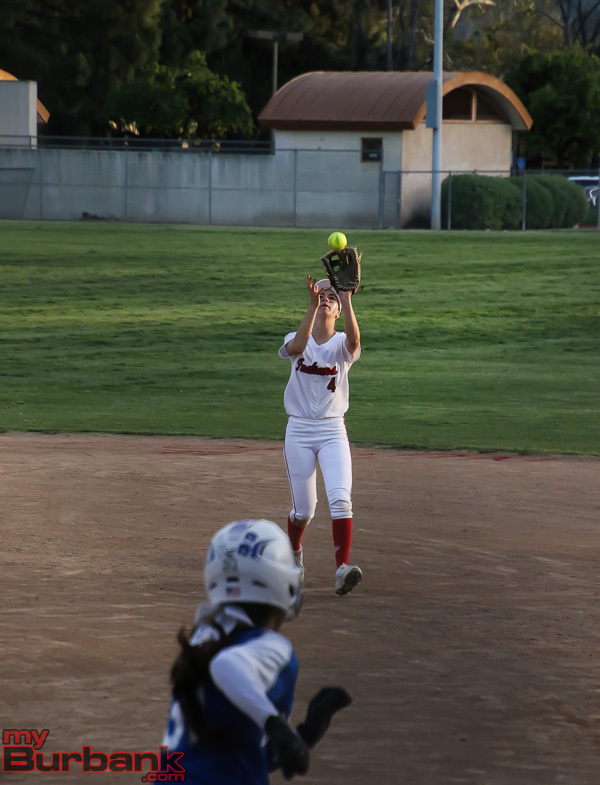 But Burroughs would not score again. 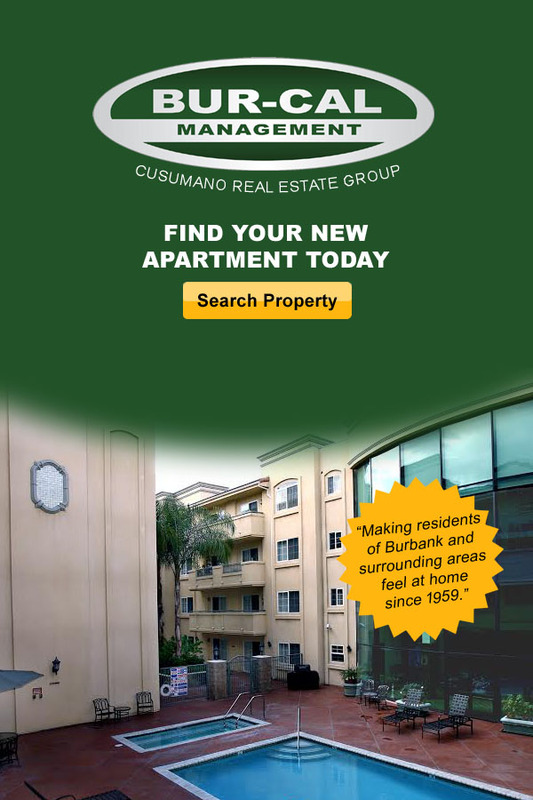 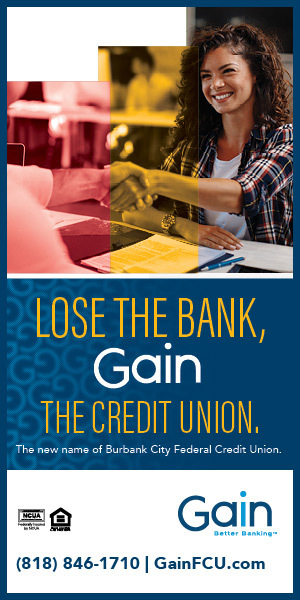 “That’s what we’re working on. 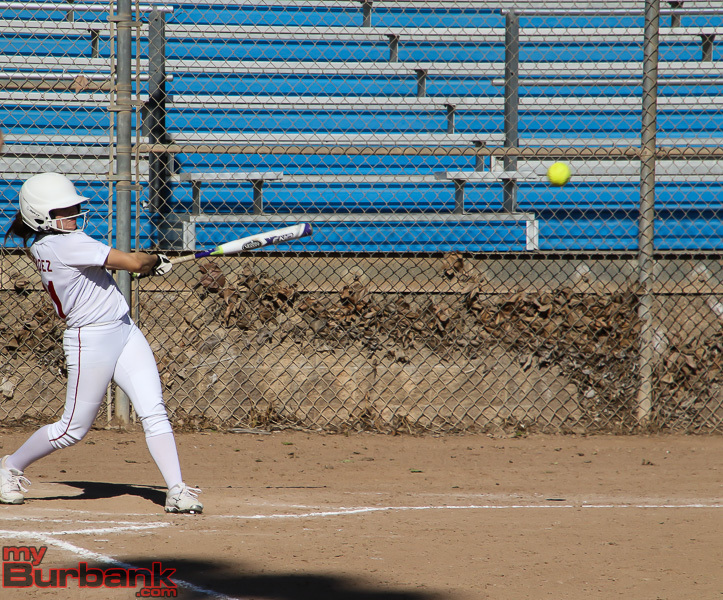 We’re trying to put together a whole game where we’re playing well offensively and defensively,” Oganyan said. 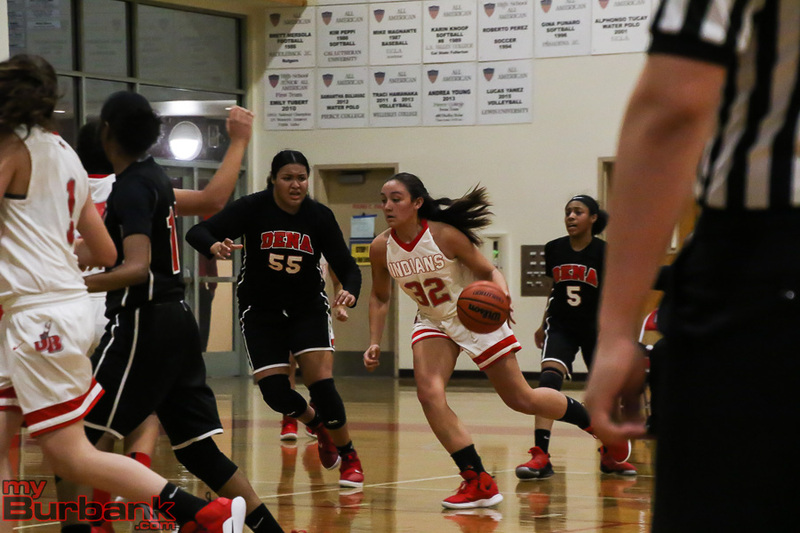 Pasadena (6-3, 4-1) received a stellar performance from junior Kamesha Moore, who scored 21 of her game-high 27 points in the second half. 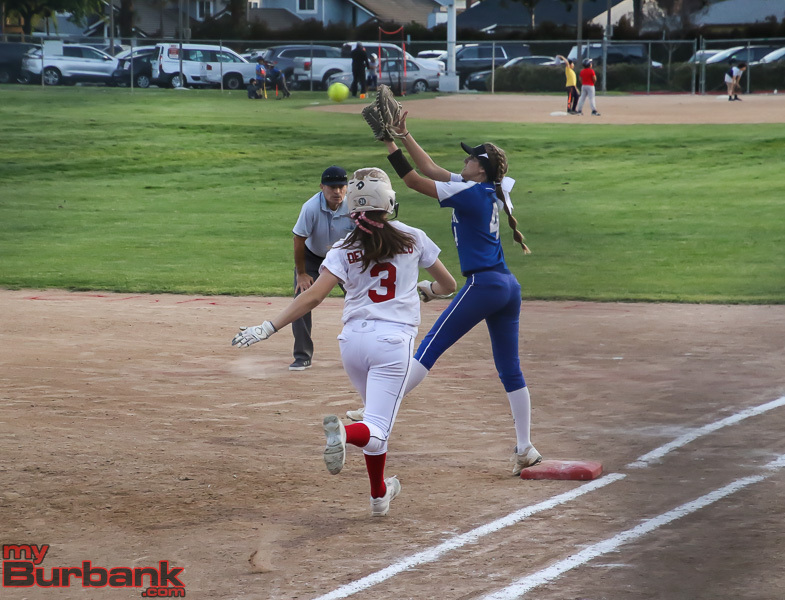 Pasadena jumped out to a 7-0 lead to start the game before Burroughs came back to take a 10-9 lead at the end of the first quarter. 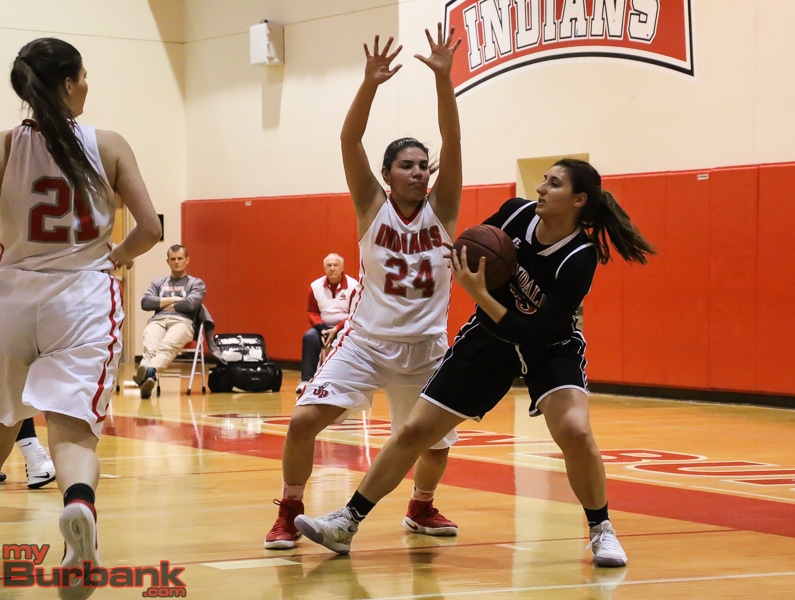 The Indians extended the lead to 31-25 at halftime. 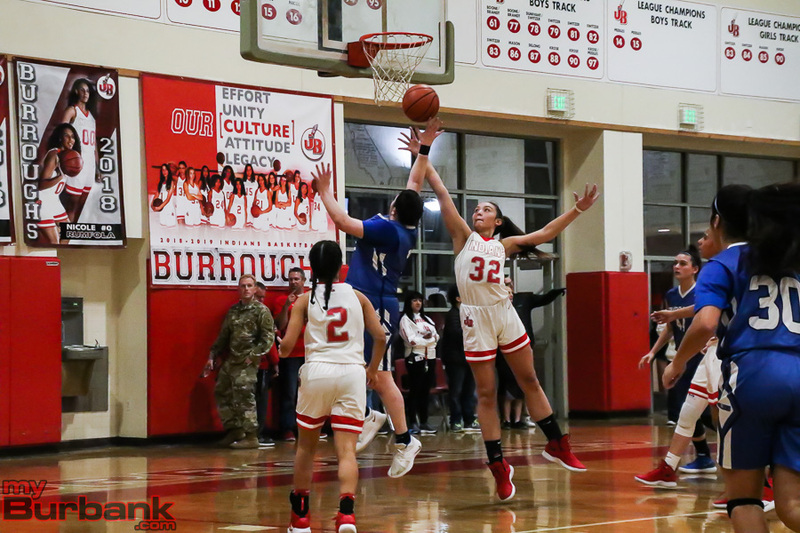 Burroughs led 39-29 following a three-point play by sophomore Faith Boulanger with 5:45 left in the third quarter. 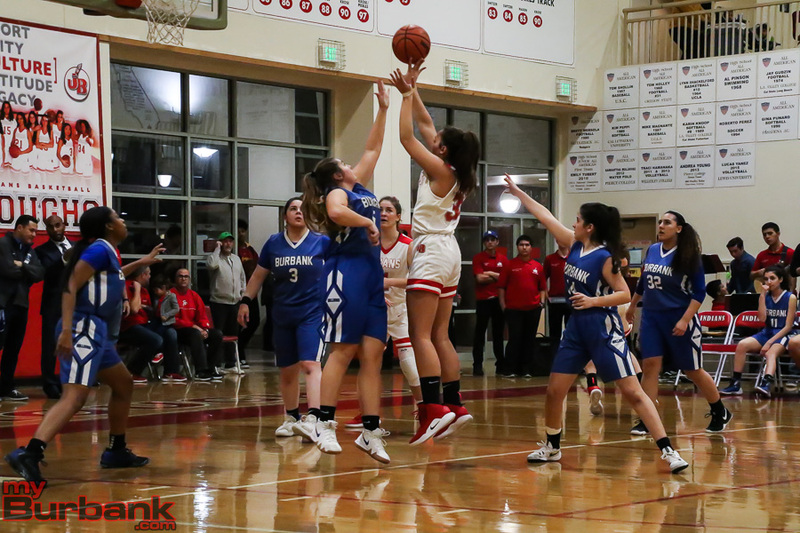 Pasadena fought back to tie things at 44 heading into the final quarter. 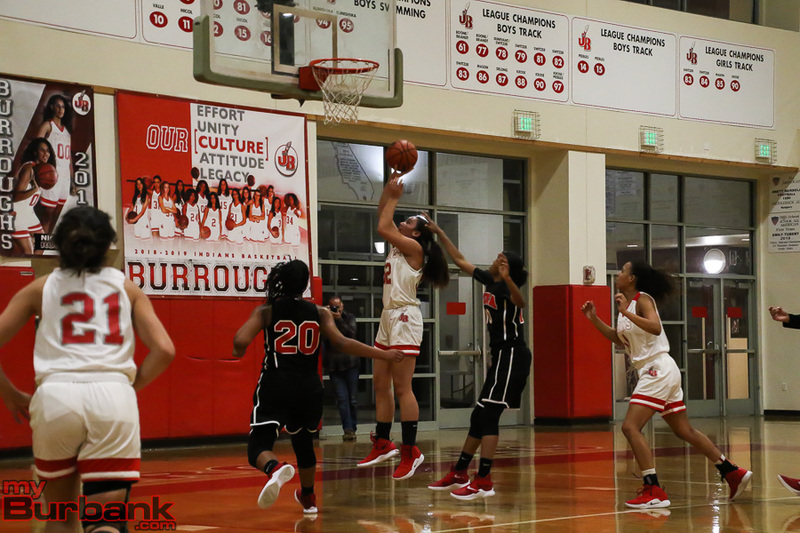 Burroughs was led by Boulanger, who had 20 points, nine rebounds, and four assists. 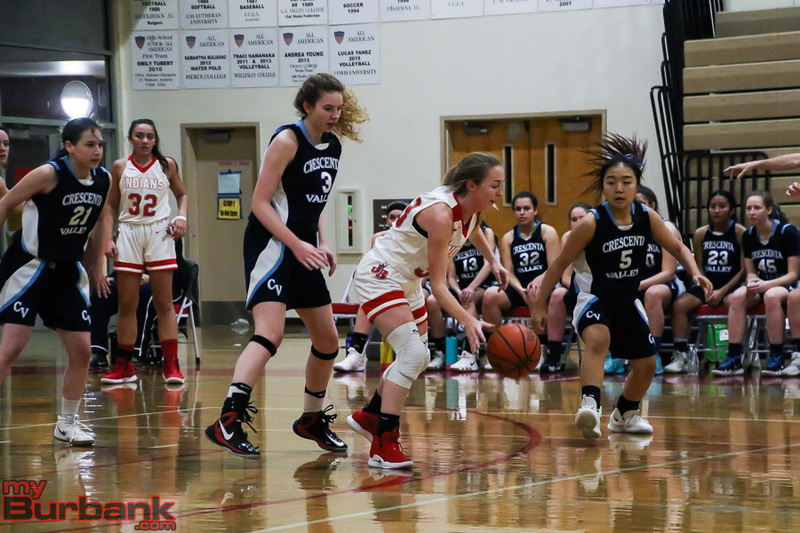 Wrobel, who is also a sophomore, had 12 points, 11 rebounds, five assists, and four steals. 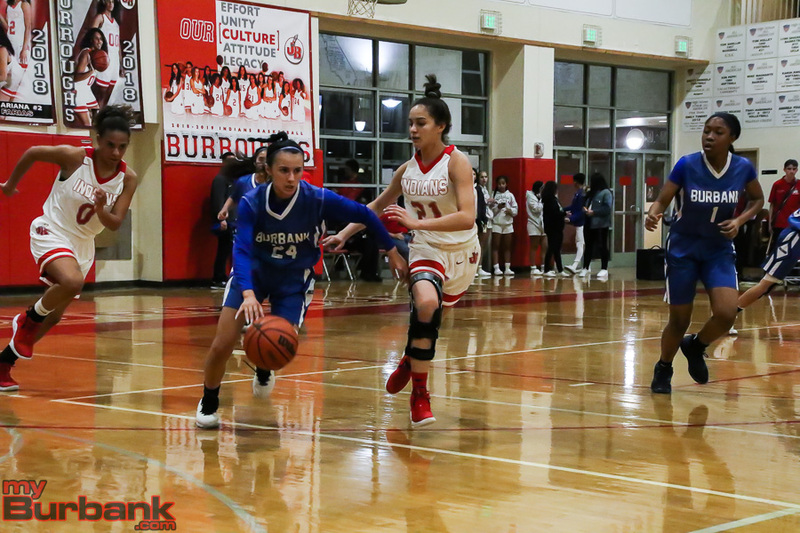 Freshman Noor Fahs had 10 points for Burroughs. 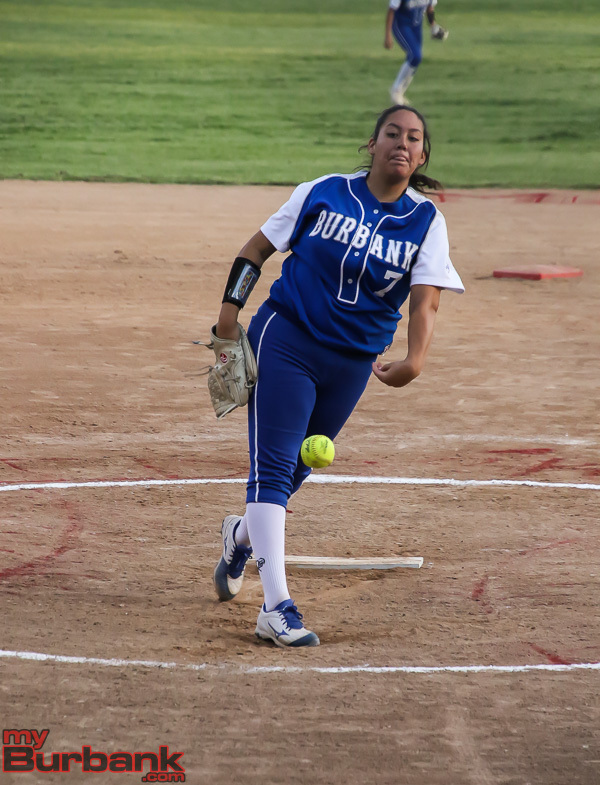 Dyani Del Castillo had six points. 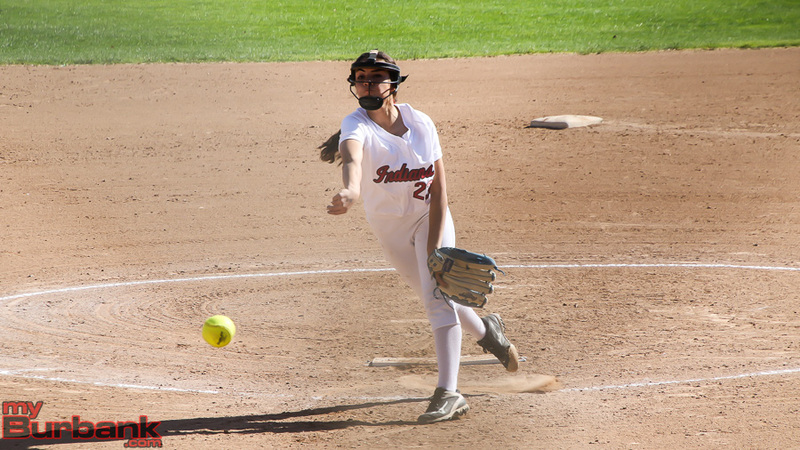 Camryn Lotka and A’sia Morales each had three points for the Indians and Nicole Rumfola had two points. 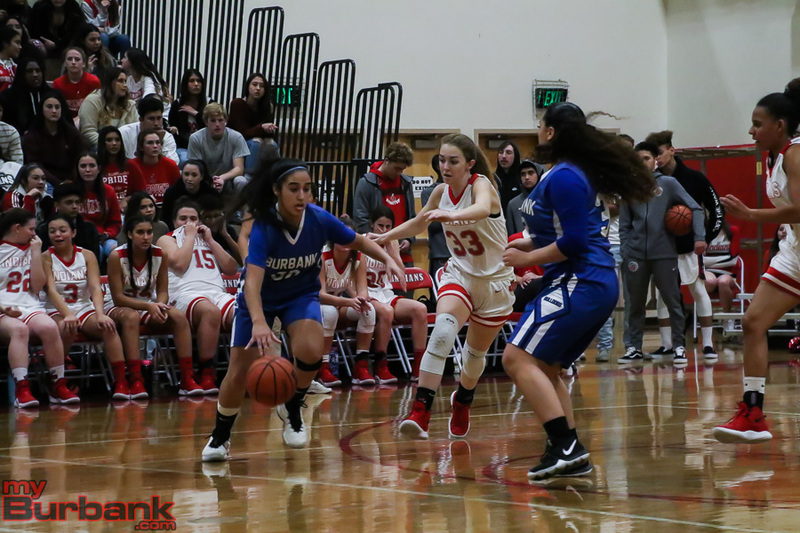 This entry was posted in Girls Basketball, Sports and tagged Burroughs Girls Basketball, Camryn Lotka, Dyani Del Castillo, Faith Boulanger, Kayla Wrobel, Nicole Rumfola, Noor Fahs on December 21, 2018 by Jim Riggio. 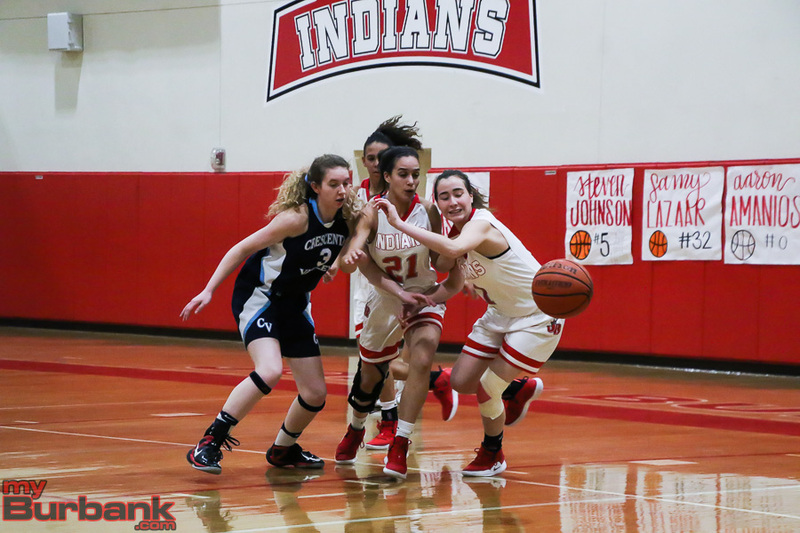 For a good portion of Tuesday’s Pacific League girls’ basketball contest between visiting Burroughs High and Crescenta Valley, the Indians were in the driver’s seat. 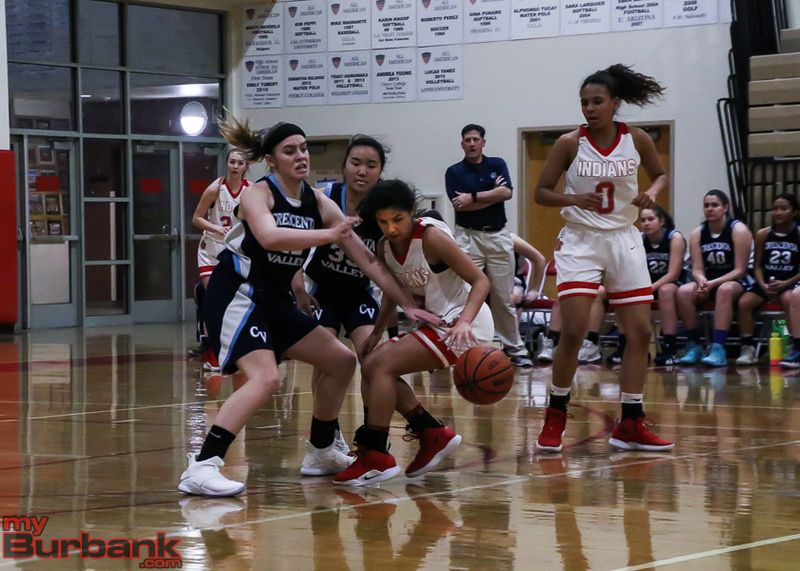 This didn’t matter too much as the Falcons seized control in the last minutes and held on for a 46-43 win. 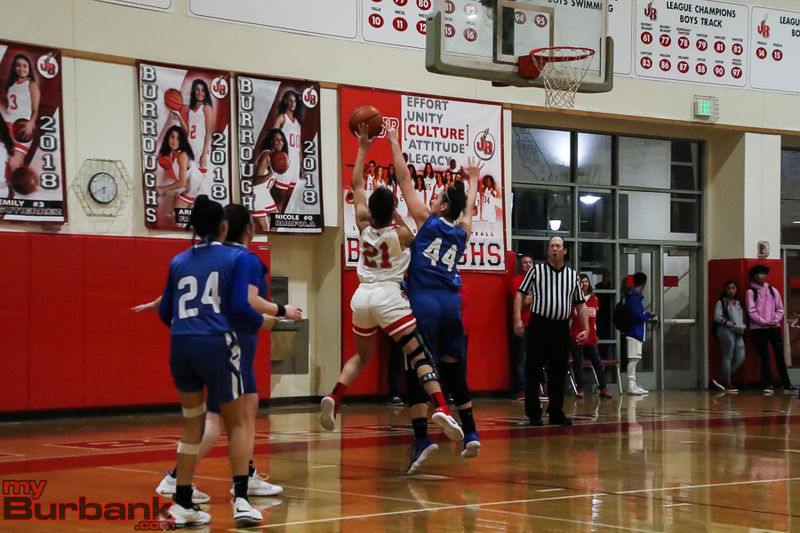 The Indians had several empty trips late in the match due to turnovers, but the key hoop was turned in by senior shooting Caity Bouchard (15 points) with 1:50 left in the fourth period as the Falcons moved ahead 38-37. 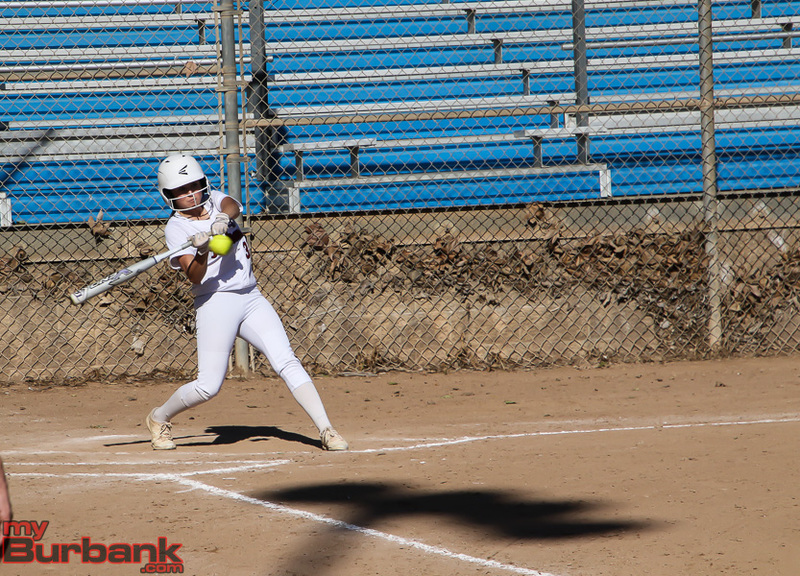 The win by the Falcons snapped the Indians’ nine game-winning streak and gave Crescenta Valley a 7-5 record and 3-1 mark in league play, while the Indians are 9-1 and 2-1 in league action. 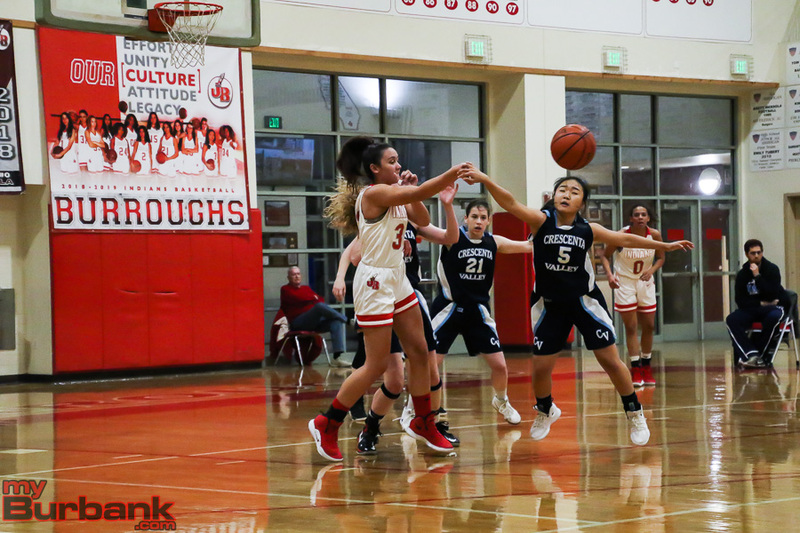 Burroughs, which made one of 11 shots from the floor at one juncture late in the final period, forged ahead 10-7 in the opening frame and then darted in front 21-15 at the intermission. 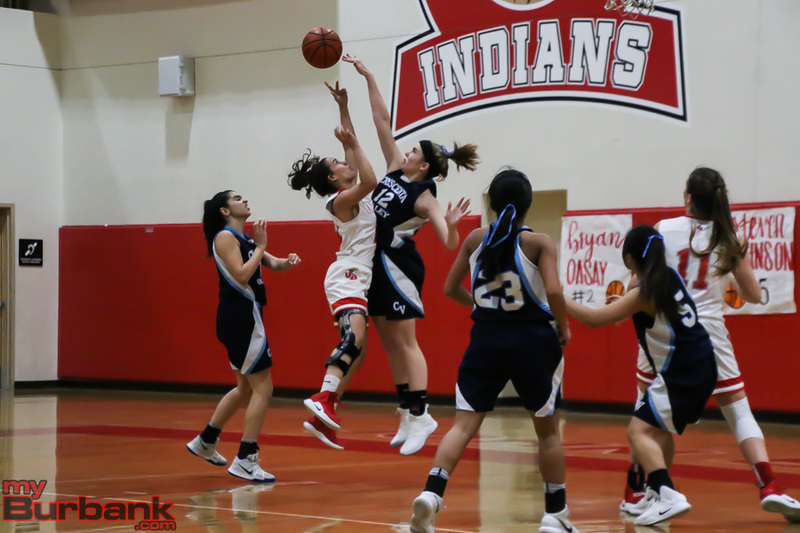 The Indians were in charge 33-26 heading in the final frame and were ahead until about two minutes were left. 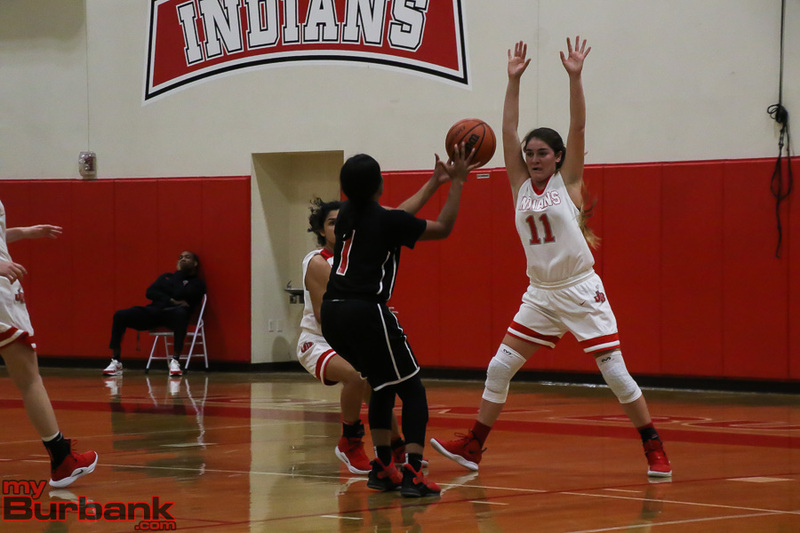 Leading Burroughs was sophomore power forward Kayla Wrobel, who dropped in a team-best 13 points. 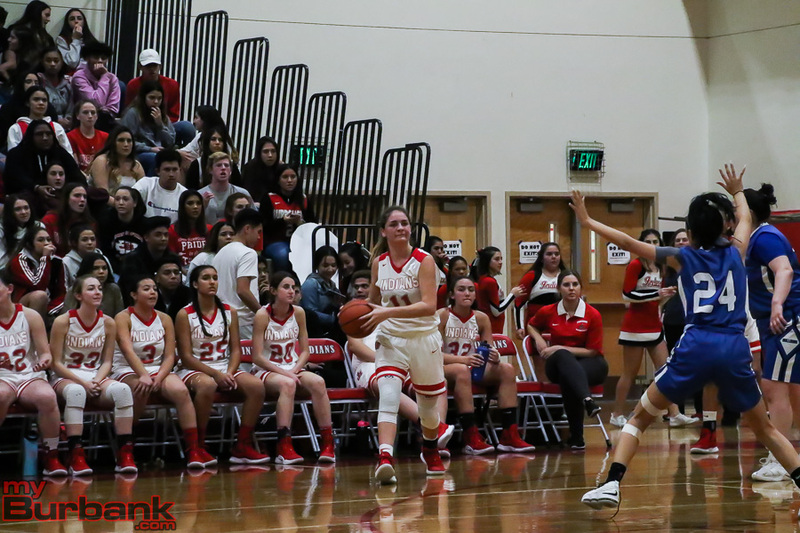 The Falcons, who hit nine of 14 from the free-throw and five of 11 from the floor in the fourth quarter, were led by senior guard Georgina Kregorian with a game-best 19 points. 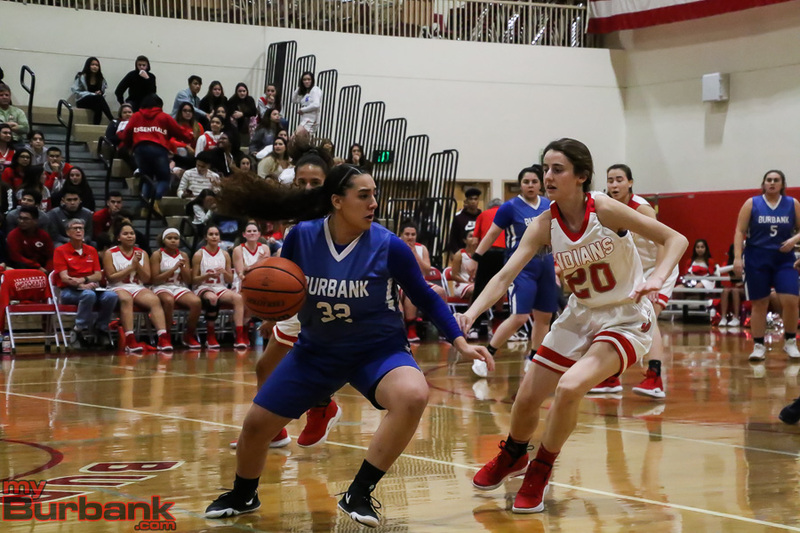 Burroughs, which shot 28 percent from the floor (14 of 50) took a three-point lead in the opening frame as senior small forward Nicole Rumfola scored three of her six points as the Indians converted four of 20 shots from the floor. 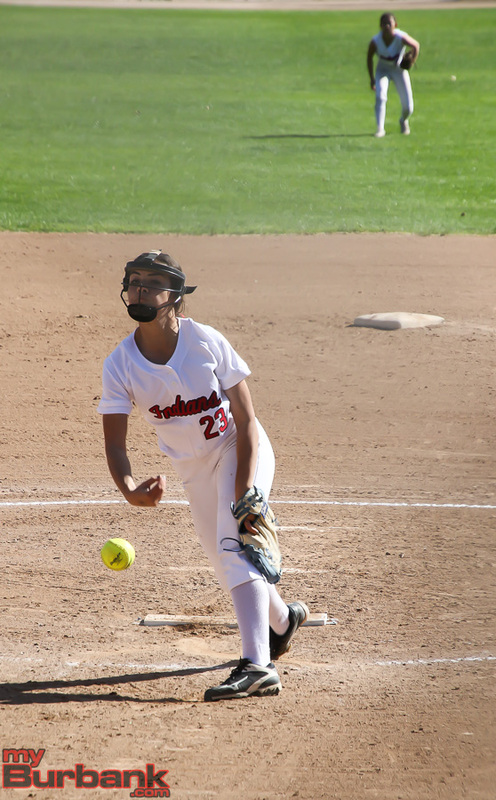 The Indians, who drilled 13 of 25 from the charity line for 52 percent, converted three of 19 shots in the second period. 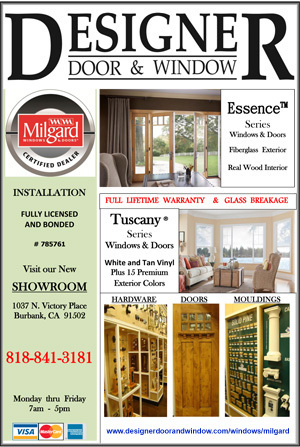 Burroughs held a six-point edge at the intermission as Boulanger (11 points) scored five points. 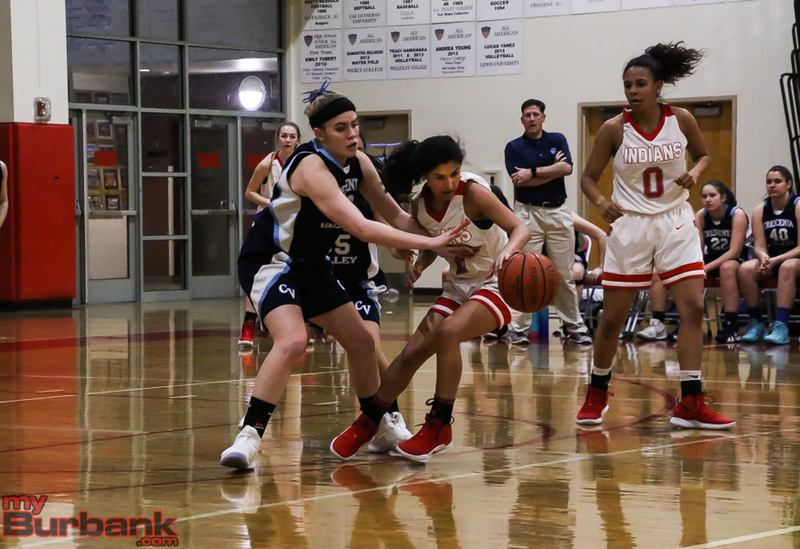 Boulanger was slapped with her fourth foul midway through the third quarter and missed about half of the fourth period. 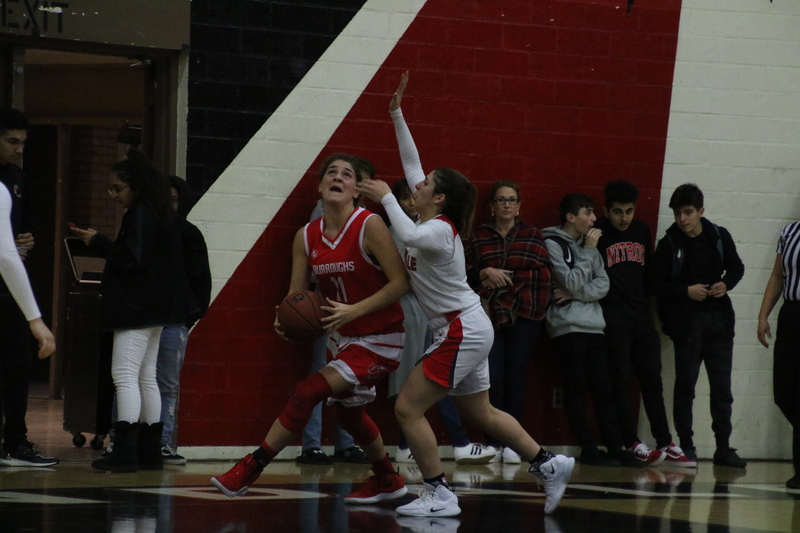 Kregorian scored five points in the first quarter and then added two points in the second stanza as the Falcons (31.1 percent on 14 of 45 from the field) made three of 12 in the first period and three of 10 in the second quarter. 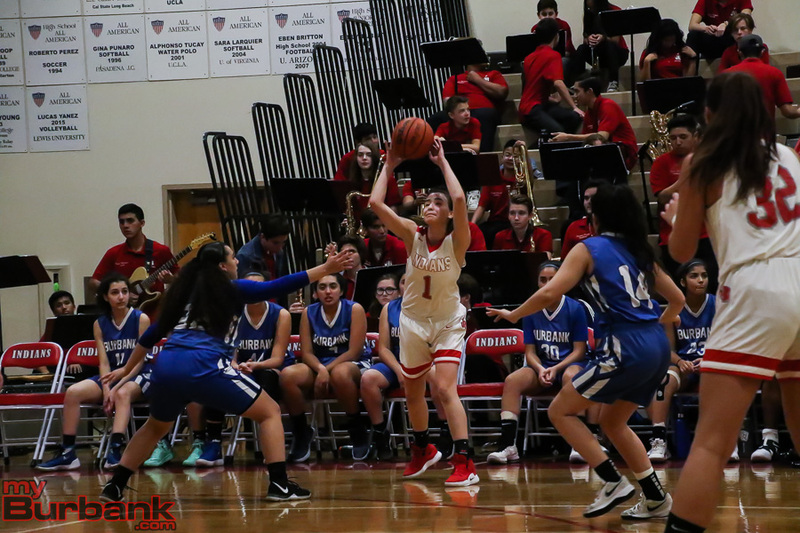 The third period saw the Indians drill four of eight from the floor and hold a 12-11 scoring edge with sophomore power forward Kayla Wrobel tallying six of her eight points. 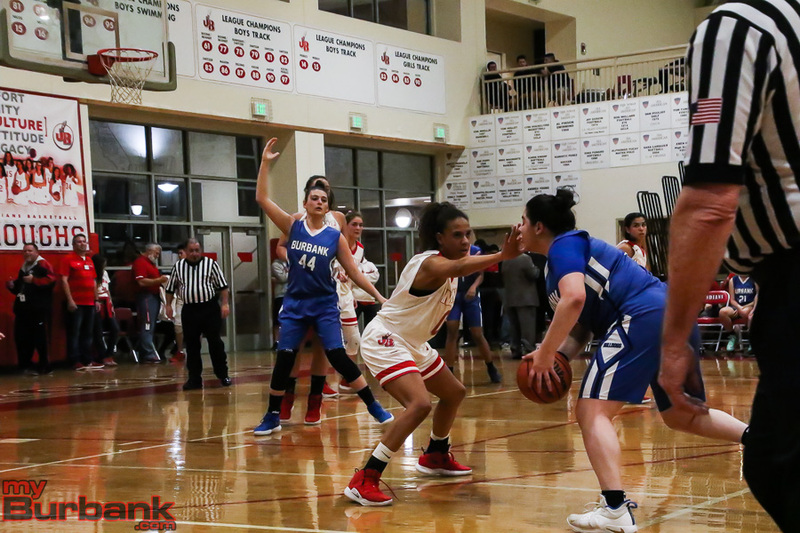 In that frame, Kregorian scored eight points as the Falcons were successful on three of 12 from the floor and five of eight from the free-throw stripe and made 16 of 26 for 61.5 percent during the game. 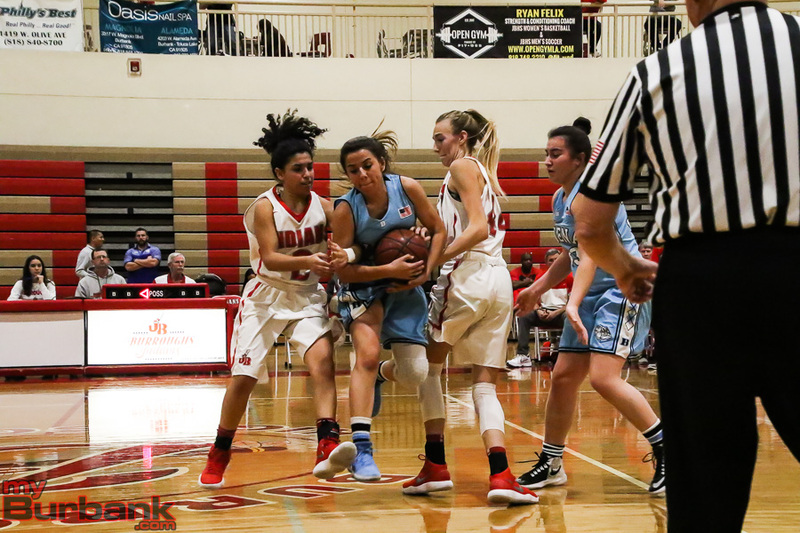 Senior guard Camryn Lotka scored five points for the Indians, while senior point guard Ariana Farias dropped in four. 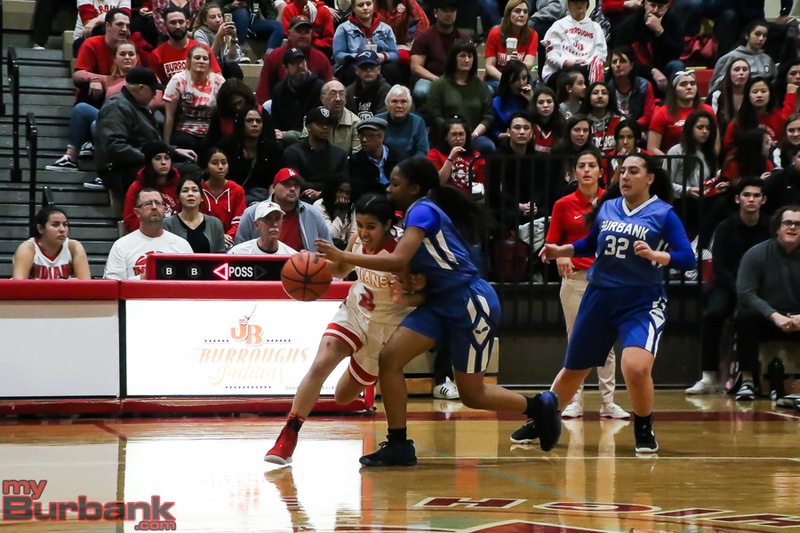 Sophomore guard Dyani Del Castillo and senior guard Sophie Hawkins each had two points and junior guard A’sia Morales added one point. 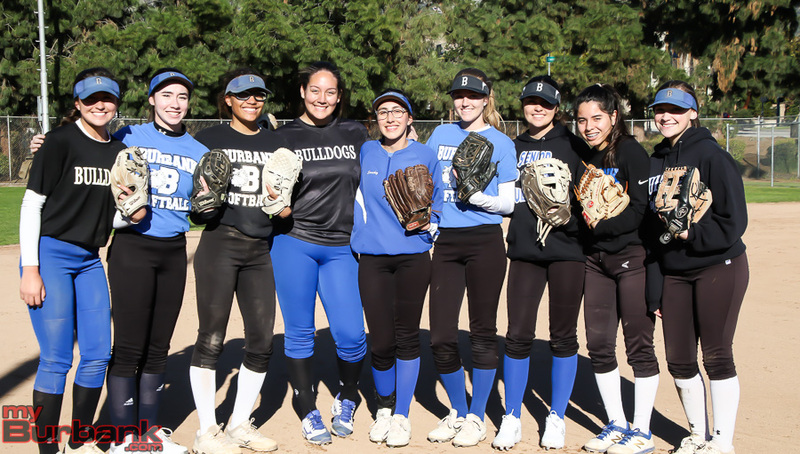 This entry was posted in Girls Basketball, Sports and tagged A'sia Morales, Ariana Farias, Burroughs High, Camryn Lotka, Dyani Del Castillo, Faith Boulanger, girls basketball, Kayla Wrobel, Nicole Rumfola, Pacific League, Sophia Hawkins on December 12, 2018 by Rick Assad.